Congratulations to all trophy winners and thank you to all the competitors who travelled to the various venues and made all the race events competitive and enjoyable. Over all a total of 97 individuals participated in the series. Thanks to those clubs that organised the races and to Snowsport Scotland for providing the series trophies. This entry was posted in Racing, Rollerskiing, Uncategorized on October 5, 2016 by DavidHorsley. This entry was posted in Club Race Results, Racing, Rollerskiing on May 30, 2016 by DavidHorsley. This entry was posted in Racing, Rollerskiing on September 24, 2015 by DavidHorsley. This entry was posted in Club, Club Race Results, Racing, Rollerskiing on September 7, 2015 by DavidHorsley. This entry was posted in Club, Racing, Rollerskiing, Upcoming Events on August 10, 2015 by DavidHorsley. 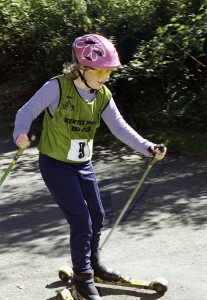 This entry was posted in Racing, Rollerskiing on September 14, 2012 by Alan Telford. This year’s Huntly Championships were blessed with some of the best weather we have seen in the last 5 years. From the start of the races we had wall to wall sunshine and not a drop of rain fell on the track all day. 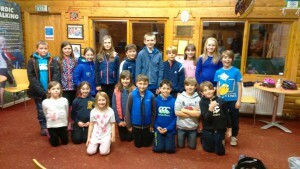 There was an impressive turn out in the Novice class with 11 entrants highest num ber in any group for the day, it was great to see so many younger skiers racing. Caringorm put in a good showing in this class with club members Connor Sinclair and Stephanie Dare picking up the first boy and girl titles respectively. Huntly skier Laura Patterson picked up the fastest U10 title, beating her mother Zosia by 34 seconds. Huntly also did well in the U12/U14 3.7km race, Oliver Newman managed to beat his brother Fergust to 1st U14, while Lynne Gray stole a 5 second lead over Beth Maclean in the U14 F classification. In the older age groups Cairngorn dominance reasserted itself, with Robers Sircus and Hector Cowie taking off the Senior and U18 titles. Second and Third place in the Senior race was a close run thing with Carl Carrier seeing off Carl Pointer by a narrow 10 seconds. Watch out next year Mr Carrier! Huntly Skier Duncan Gibb took faster U16 M while David Horsley was the fastest Vet M. Fiona Crossley had a lonely race taking first place Vet F.
This entry was posted in Club, Racing, Rollerskiing on September 10, 2012 by Alan Telford. The Huntly Championships are coming up soon on 8th September. Please get as many entry forms to Peter Thorn in advance as possible. This work and organizations on the day, which can be stressful. Any volunteers for marshalling will be very welcome this year, expecially some helpers for Peter Thorn who will be doing the lap counting. This entry was posted in Club, Rollerskiing on August 27, 2012 by Alan Telford.